So post PhD I decided it was time to spend a bit of cash on myself, this involved buying a new monitor. That monitor was a Samsung XL2370, which is their first consumer LED monitor. Before I talk about the monitor let me explain my purchasing logic. I am a scientist by training, I’ve read a lot of peer reviewed papers over the years, I’ve even written and reviewed a couple. So I have a good grip of what the scientific process is and I know what it takes to get a paper published. It’s rare that people get to publish stuff that is completely unfounded, peer review generally kills this off. You can also work out what the current scientific consensus is on an issue by quickly surveying the literature. Thus to me, based on what I’ve read in the scientific press global warming is entirely real, and hence very much a problem. There is no question that the planet is getting warmer, and unless you are feeling particularly sick and twisted and decide to look at the data with one eye closed through a bottle of Smirnoff the temperature rise is due to us. This is the scientific consensus. Everything suggesting this is not the case is put forward by the media or lobby groups or other bodies who don’t bother with data, evidence and peer review. Anyway global warming will be a problem. As such I have a simple rule. If I’m replacing an electrical item I replace it with something more energy efficient and environmentally friendly if at all possible. Thus when it came to deciding what to replace my 4 year old 19 inch Formac monitor with, an LED backlit monitor was the obvious choice. I also wanted to go widescreen and larger (in order to maintain a similar vertical height). There’s a lack of LED backlite monitors at the minute. Apple have one, but it’s glass covered and costs a fortune. Granted it’s based upon an IPS (In-Plane Switching) panel therefore guaranteeing excellent colour accuracy and the best viewing angle possible. It’s also at a tasty 1920×1200. In the end the cost and the glass ruled it out (I can’t stand the reflections). So that leaves LG, Dell and Samsung. Others are on their way, but as I sat and considered what to get these were the options. The LG got reviewed okay, the Dell did better and the Samsung seemed to be everyone’s favourite. Also I just didn’t like the look of the LG monitor. Thus I agonised over the Dell or the Samsung, unfortunately there isn’t a store that I could pop out to and have a look at the displays. I have a Dell UltraSharp in work and this is a brilliant monitor, but in the end I opted for the Samsung, slightly nervous about it’s TN (Twisted Nematic) panel. Tough to be fair the Dell and LG also use TN panels. So I ordered it, it arrived and I was instantly disappointed. The tilt on the monitor is almost impossible to use. In order to tilt the screen you need someone to hold the base while the other person grabs the two corners and pulls the monitor upwards. You feel for certain that the thing is going to break. It also makes it impossible to set the angle with any sort of precision. This appears to be a common problem. On the upside when you have set the angle it’s not going to slip. The next downside is the weight, the monitor weighs next to nothing and the stand has no ballast so it’s quite easy for knocks on the table etc to make the monitor wobble. Even typing on my IKEA table makes it vibrate, though oddly I don’t find this annoying. The stand is sturdy enough that the monitor won’t fall over at least. Next up in is the OSD (On Screen Display) and touch sensitive buttons. A lot of people seem to complain about these. Personally I’d no real problem, the Formac had touch sensitive buttons, which perhaps responded better due to their larger size but it’s much of a muchness. Honestly, how often do you end up changing your monitor settings anyway? What does erk me though is the LED power light. It’s brightness is fine (and controllable) but the light is designed to line up with the power symbol when view directly. As you are always viewing it from above it simply doesn’t line up which I find slightly irritating. See what I mean, it just doesn't line up..
And while I’m on the subject of sad things, Samsung seem to feel that I should assemble a European plug into a UK plug that looks like it has gained all the weight that the monitor lost during the LED transition. 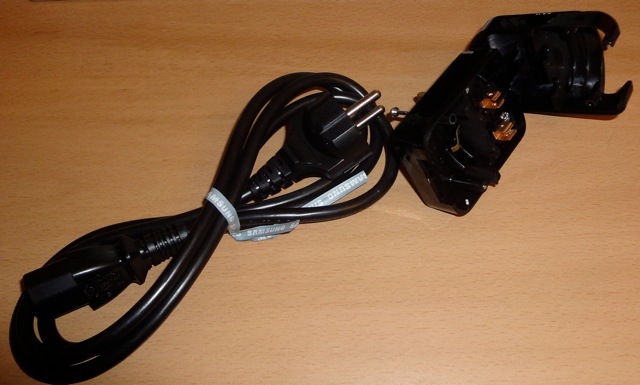 Ship a proper UK plug please. For the money it should come with a proper UK plug. Finally we get onto the display itself. Here my greatest fear came to fruition. Colour consistency is just a bit naff. The Formac had a MVA (Multi-domain Vertical Alignment) panel, which basically sits somewhere between TN and IPS in terms of performance. You could maybe question how true the colours are but at least they are consistent across the screen (with viewing angle). With the TN panel this just isn’t the case. 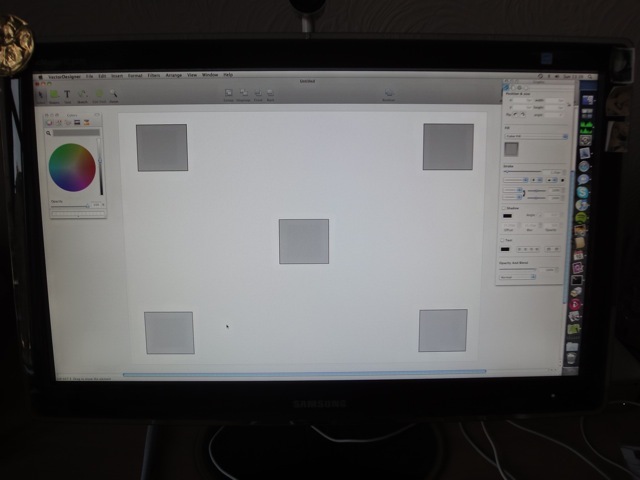 Open a drawing program, draw a grey box at the top of the screen, copy it and move it to the bottom and you’ll see a different shade of grey. This was depressing. At this point I seriously considered sending the monitor back. Though the thing is, I rarely do much graphics work, unlike my brother I’m not an artist who cares about colour accuracy and consistency every day. Occasionally I knock up some stuff for a web page or presentation and of course there is the matter of tweaking photos, though it is much less noticeable here. I should also point out that TN panels don’t provide as many colours as an IPS panel, but what you can’t see doesn’t tend to bug you so much. In the end I didn’t feel I could justify spending much more for a better panel technology. 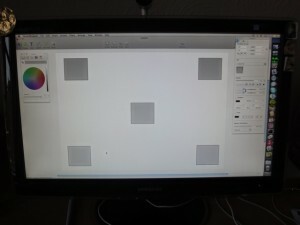 As you can see the grey boxes at the top are darker than those at the bottom despite being identical. On the upside the monitor is very pretty, the LED backlight is very white and very bright. 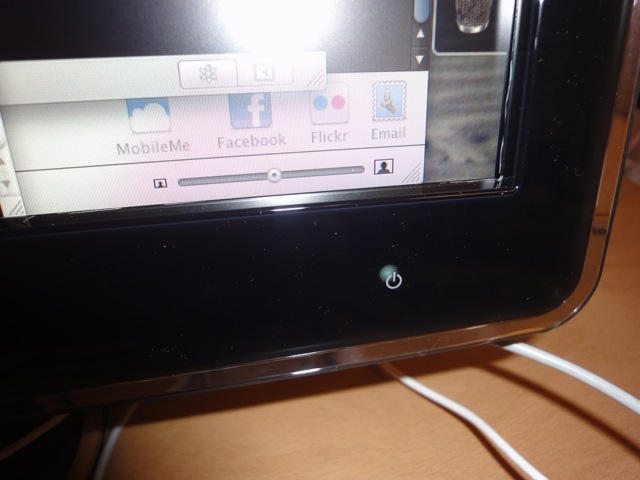 I have my brightness turned down to 45 %. It uses about 20-25 W with the settings I have, compared with the 38 W for the smaller Formac. The extra screen space was at first overwhelming, plus the change in aspect ratio felt uncomfortable. I’ve gone from 1280×1024 to 1920×1080. However, the main reason for the switch to wide screen was to enable me to read in one window while typing in another. It was either that or a two monitor setup. I have to say, I’ve gotten used to the extra space very quickly. Video play back is impressive with DVDs and HD content of the BBC iPlayer looking very crisp and clean. Plus blacks are that bit blacker. On the whole if I had to score the monitor out of 5 I’d give it 3.5. It loses half a point for the ridiculously stiff hinge that controls the tilt plus the cheap, assemble your own, UK plug. It looses another point between the TN panel, which does not provide consistent colour across the screen and the reasonable price premium for the LED backlight. In summary then if you care about colour, avoid and spend more on an IPS panel. If you need height adjust or regularly change the angle of your screen, avoid as there is no height adjust and the hinge is rubbish. If you don’t care about these and want an efficient, bright, crisp and pretty monitor for use at home then the Samsung is probably a pretty good choice. If you are in no rush then I suspect the situation will be much better by the end of 2010. By then many more manufactures will offer LED models and the number of models available from each manufacturer will improve significantly. I would also expect that prices will fall a bit unless the global recession results in significant inflation. Hence by the end of the year you will probably be able to find the prefect LED monitor for your needs.